A Sakuddei shaman (sikerei) in Siberut Island, Mentawai Islands. The Sakuddei or Sabiroet people are an ethnic group, one of at least eleven, on the island of Siberut, Indonesia. 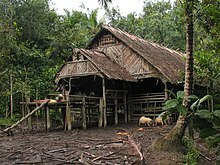 Siberut is the northernmost of the Mentawai Islands which are located 130 km (81 mi) to the west off the coast of Sumatra. The Sakuddei live in south-central Siberut in an egalitarian society, cut off from the outside world. 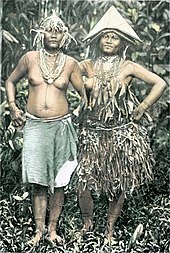 They speak a dialect of the Malayo-Polynesian Mentawai language. Their society has been described as classless, egalitarian, without leadership and warfare and with equality among men and women. They are described as living in peaceful harmony with their environment and with other groups. According to Bakker (2007), the Sakuddei have commonly avoided modernization campaigns by retreating into Siberut's interior. River banks where the Sakuddei reside in Siberut. Through known history, since the missionaries started conversion of indigenous people into Christianity, the ethnographic profile of the people of Siberut has been closely observed by many anthropologists. The earliest record of the island people is by Sir Thomas Raffles, who after visiting the island in 1821, commented “I made further discoveries in these Islands, where I found a population more likable still and, if possible, still more ingenuous. If I continue in this direction, I may expect somewhere to find the "Garden of Eden", and descendants of our first parents." The first conversion of the indigenous people was started by the Italian Missionaries in 1912, though earlier efforts made from 1911 had resulted in the murder of the missionary named Reverend Mr. Lett in 1916. This is the first reported effort at elimination of the local ethnic culture of shamanism. Some Catholic priests understood the nuances of ethnic culture and adopted many of the ethnic customs such as wearing beads while offering sermons during mass. However, in 1917, J.F.K. Hansen, the Dutch Army Captain, was critical of the pagan customs of the local people and wondered how this custom could be discouraged. 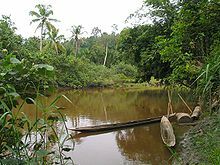 In the early 1990s, plans were afoot to develop the rain forests of the Mentawai Islands where the indigenous people of Siberut, the Sakuddei, one of the few Siberut clans live, into a palm oil plantation, as a commercial proposition. The Government of Indonesia has also not been averse to this conversion since palm oil, an imported item, could be produced on a large scale locally, which would save foreign exchange and supplement the local economy of the country. The district administration at one stage, in the 1980s, had even ordered discontinuing the shamanistic rites and forcible possession of the ethnic paraphernalia of shamanism, which was later stopped. However, in recent years, with international publicity to the local ethnic people, through various media channels, the area where the Sakuddei live has attracted tourist influx, which is now identified as an economic benefit. In spite of efforts by various international agencies to influence decision making on encroaching civilization of local ethnic groups, a Philippines timber company has been granted a logging concession in their area, which is threatening their distinctive way of life. All this is happening in spite of the area having been declared as a "Biosphere Reserve" by UNESCO, in 1981. World Wide Fund for Nature (WWF) is persisting with its conservative efforts in association with Andalas University of West Sumatra "to study and monitor socioeconomic and biotic conditions in Siberut and the rest of Mentawai". Ethnic women of Siberut with tattoo painting. A traditional Sakuddei communal house, "uma longhouse" in Siberut. Their traditional house, an "uma longhouse", is built on stilts. This traditional house, located along the river banks, is where formal ceremonies known as punen are held, when the entire clan assemble here. However, under normal circumstances the rimata and his immediate family reside in the uma, which are distinct from the habitats developed by the Dutch as thickly populated ghettos during their colonial rule. Generally, the lay out plan of Uma, the building traditionally common to the people living in Siberut, has been elaborated by Reimar Schefold, as a three part structure with multiple floors. The gables slant outwards with a number of finials. It has outward sloping walls. The roof appears in the shape of a saddle and the structure is built with timber with a degree of difference between the roof and the tip. Practical and social reasons, aesthetic values, symbolic representations are the main attributes of these structures. It is also said that many a times the symbolism pervades the design of the building. In 1980, Jowa I. Kis-Jovak noted that during adolescence, some Sakuddei boys build themselves a special house. ^ "The Sakuddei of Indonesia, Disappearing World series, Produced by Granada Television International". filmakers.com. 1987. Retrieved 30 October 2010. ^ a b c d e f g h i j "Can Siberut Be Saved?". Cultural Survival. Retrieved 2010-10-30. ^ Bakker, Laurens (2007). "Foreign images in Mentawai Authenticity and the exotic". Bijdragen tot de Taal-, Land- en Volkenkunde. Koninklijk Instituut voor Taal-, Land- en Volkenkunde. 163 (2/3): 279. ^ "The Sakuddei". therai.org.uk. Retrieved 30 October 2010. 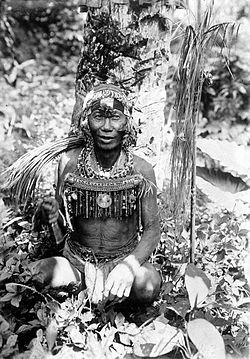 ^ As described by Schefold, R., Speelgoed voor de zielen: Kunst en cultuur van de Mentawai-eilanden. Delft/Zürich: Volkenkundig Museum Nusantara/Museum Rietberg. (1979/80) and others. ^ Schefold, Reimar; P. Nas; Gaudenz Domenig (2004). Indonesian Houses: Tradition and transformation in vernacular ..., Volume 1. NUS Press. p. 9. ISBN 9971-69-292-9. ^ Fox, James J. (1993). Inside Austronesian houses: perspectives on domestic designs for living. ANU E Press. p. 229. ISBN 0-7315-1595-1. Wikimedia Commons has media related to Sakuddei people.